You can set desktop notifications for an email, so you'll know when someone opens your email. If you're on the Small Business tier and above, you'll also know when someone clicks a link or downloads a file. To turn on desktop notifications for an individual email, hover over the Track button on the bottom bar, and click the box next to Show desktop notifications. To change the default behavior, head to the Tracking section of your Mixmax settings. 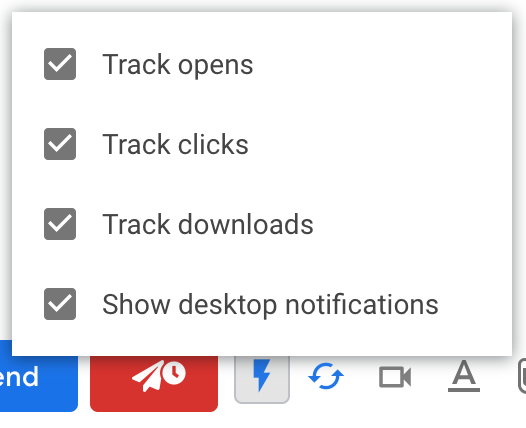 Check (or un-check) the box next to Turn on real-time desktop notifications for opens, clicks and downloads. If you don't see your notifications, make sure you turn off your computer's Do Not Disturb setting. Mac users: here's how to turn off Do Not Disturb. Windows users: here's how to adjust your settings for Notifications and Quiet Hours.